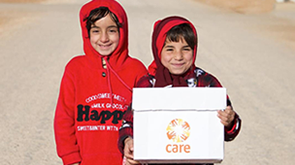 CARE was founded in the United States in 1945 to send ‘CARE packages’ – packages of food and basic supplies – to millions of people in Europe in danger of starvation following World War Two. Some 100 million CARE packages reached people in need during the next two decades, first in Europe and later in Asia and other parts of the developing world. Britain received its last CARE packages in 1955. Initially we continued to focus on food aid, but in the 1960s we expanded our remit to set up pioneering primary health care programmes. In the 1970s, we responded to massive famines in Africa with both emergency relief and long-term food security and sustainable farming programmes. In the following decades, we increasingly took a ‘rights-based’ approach to development – recognising that poverty is often caused by the absence of rights, opportunities and assets, due to social exclusion, marginalisation, and discrimination. We also started focusing on women’s empowerment, recognising from our decades of poverty-fighting experience that women are key: by empowering women, entire families and communities can be lifted out of poverty. Originally CARE stood for Cooperative for American Remittances to Europe, but in 1993 this was changed to Cooperative for Assistance and Relief Everywhere. Today, CARE is one of the world’s leading global poverty-fighting organisations, supporting hundreds of development and humanitarian aid projects in more than 70 poor and developing countries around the world. Find out more about our aims for 2015-20. Transformation: we believe in urgent action, innovation and the necessity of transformation – worldwide and in our own organisation. Integrity: we are accountable to the people and partners we serve, transparently sharing our results, stories and lessons. Diversity: we know that by embracing differences, actively including a variety of voices, and joining together, we can solve the world's most complex problems. Excellence: we challenge ourselves to the highest level of learning and performance, tapping the best of the human spirit to create impact. Equality: we believe in the equal value of every human being and the importance of respecting and honouring every individual; we know that change happens through people. CARE International operates in more than 90 countries around the world. We run poverty-fighting programmes and deliver life-saving aid in 79 developing countries. This work is supported by global policy and advocacy work, fundraising, and programme management provided by CARE offices in countries like the USA and the UK. CARE International UK was founded in 1985 and we are one of 14 full members of the global CARE International confederation. As well as supporting CARE’s humanitarian and development work around the world, CARE International UK provides specific expertise in the areas of women’s economic empowerment, inclusive governance, humanitarian response (particularly shelter, and gender in emergencies), and engaging with the private sector. We also play a key role in CARE’s work engaging with and influencing policy-makers and decision-makers to tackle the structural causes of poverty and social injustice. CARE’s programmes are implemented through CARE country offices which are supported with technical assistance and programme management by CARE members (including CARE International UK). We work in partnership with local organisations to deliver many of our programmes.